After my European travels a month or so ago, I have got myself another one of those wonderful ONE Handed watches for which I seem to have a love/hate relationship. I say this as I had a similar model to this some years ago, but got rid of it for the same reason I bought it – that One handed design. So what’s changed? 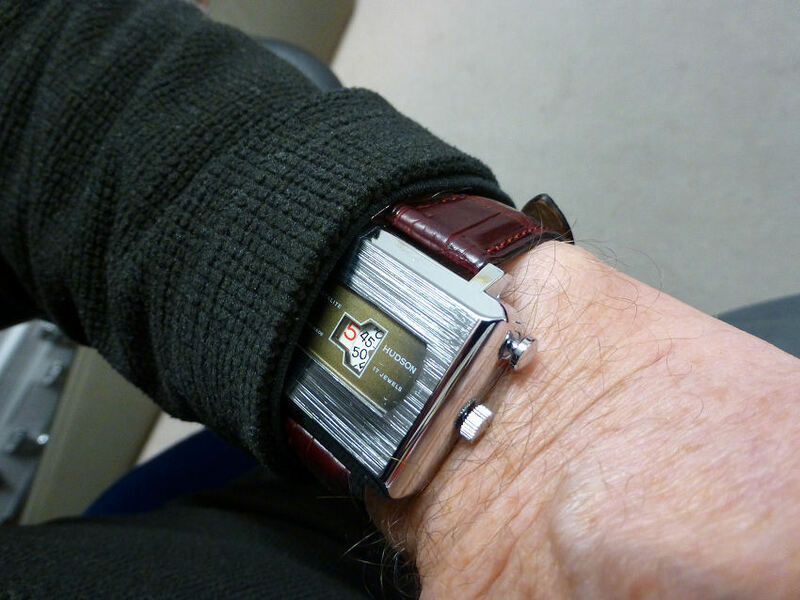 which again is One handed but this one is quartz powered, so low maintenance (stick it on the wrist and forget). However the main difference from my old mechanical Perigraph model is that it is NOT Perigraph. And because of this fact the dial is much simplified and for me that is the whole point of single hand. It IS easier to read. And to assist in this aspect it has new typography too with much clearer lettering and now sports a round Date window @6 which suits the overall look. 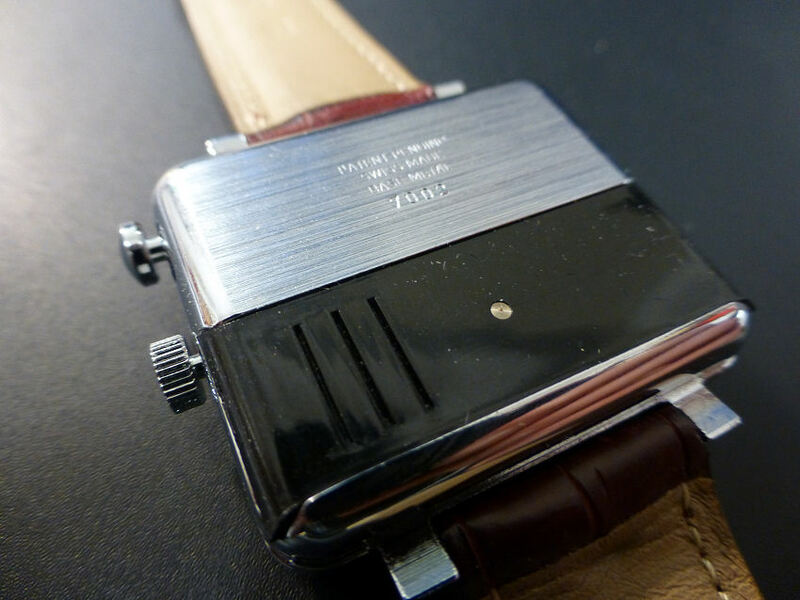 Note the undercut case – allows perfect strap fitting. Neat, stainless steel, undercut case, suede leather strap. This model is stainless steel cased and is a neat 36 mm diameter, which being honest is a perfect size for the average wrist. It is beautifully finished, sleek and smooth with a suede leather buckle strap. My model here is the black dial with white hands and numerals – it was a toss up between the normal white with black notifications, but I chose this version. It IS however a delight to read. It is very easy to so do and very clear. Each hour is divided into quarter, half and three quarters and in between these into 5 minute segments – and it is surprisingly accurate to read. Not having a second hand means that unlike most quartz models there is no jerky ticking of the second hand – instead the Hour hand (no minute hand either) very slowly and majestically sweeps around the hours with a rather stylish grace that I find very agreeable. Note on the image the case top is a larger diameter than the underside. 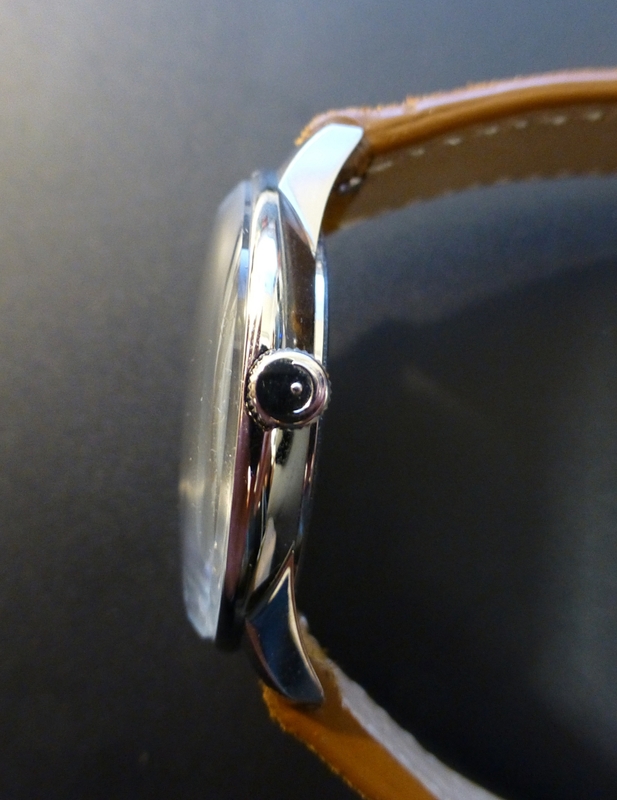 This is because the case profile is undercut, allowing perfect fitting of the straight cut strap. Also the strap features a quick release fitting spring-bar. This model is not luminous which is an omission in my opinion, but basically this is a dress watch, hence the lowly 3 Bar water resistance, but certainly adequate for the intended purpose. 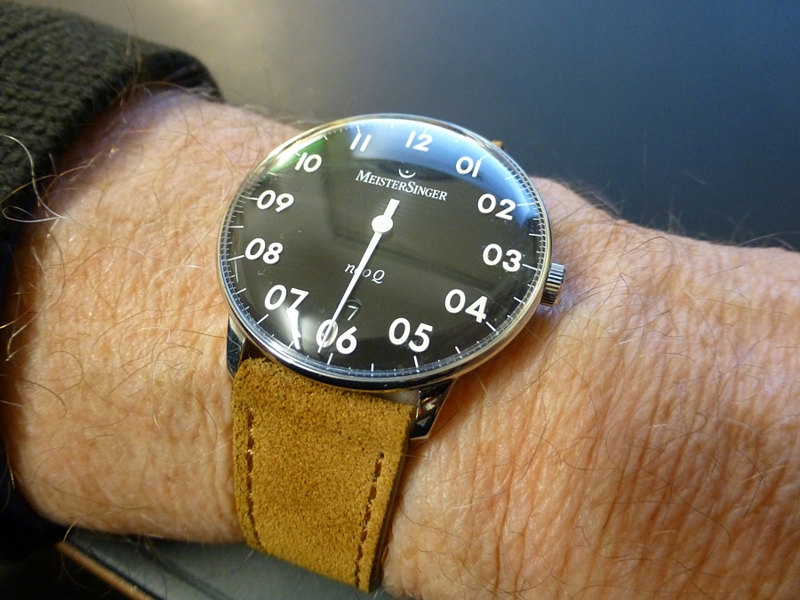 Overall a very nice watch to own – I like it. On the wrist – just about perfect. 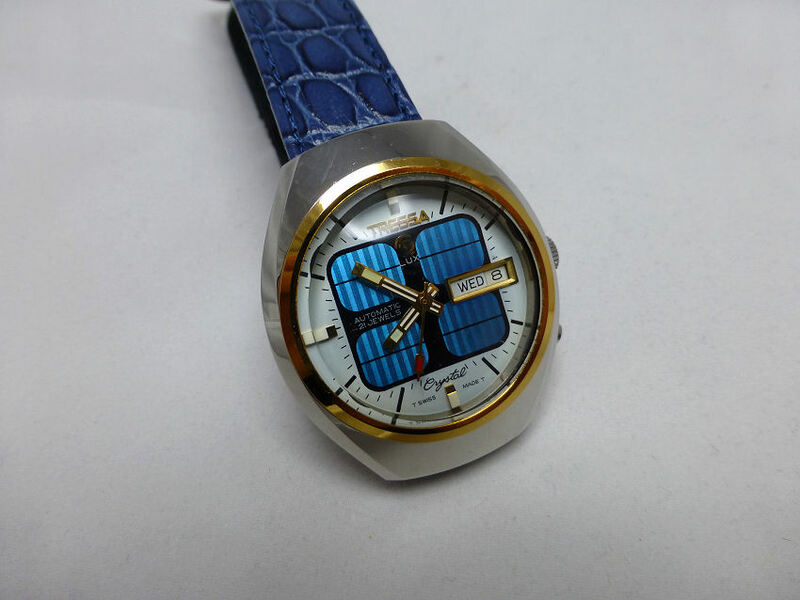 Here’s a neat Ladies Sorna model from the 1970’s – the Sorna Jump. Another Watch Company long gone and not too much known of them. 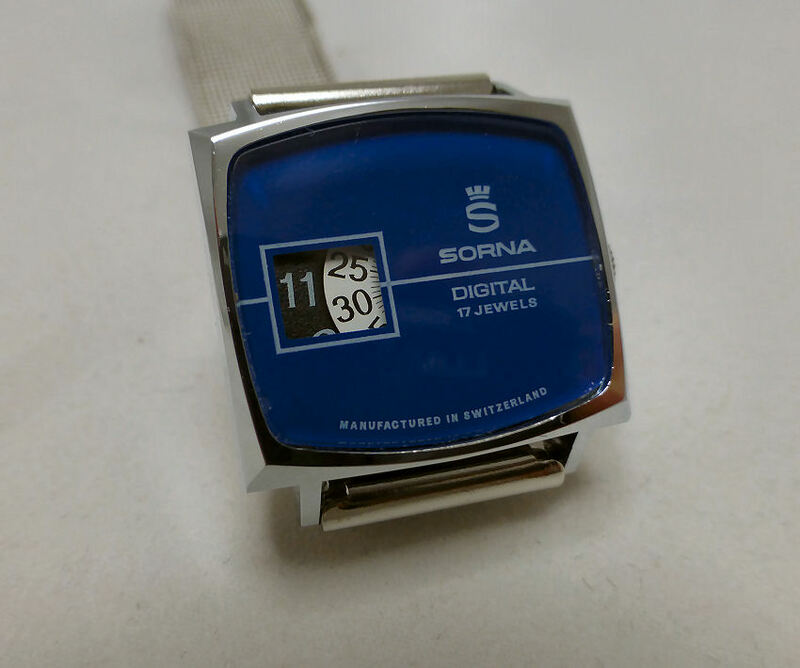 Swiss of course and originally from Grenchen, they used to manufacture watches under the brand names of Sorna, Sorina, Sornana and a few others with similar sounding names. 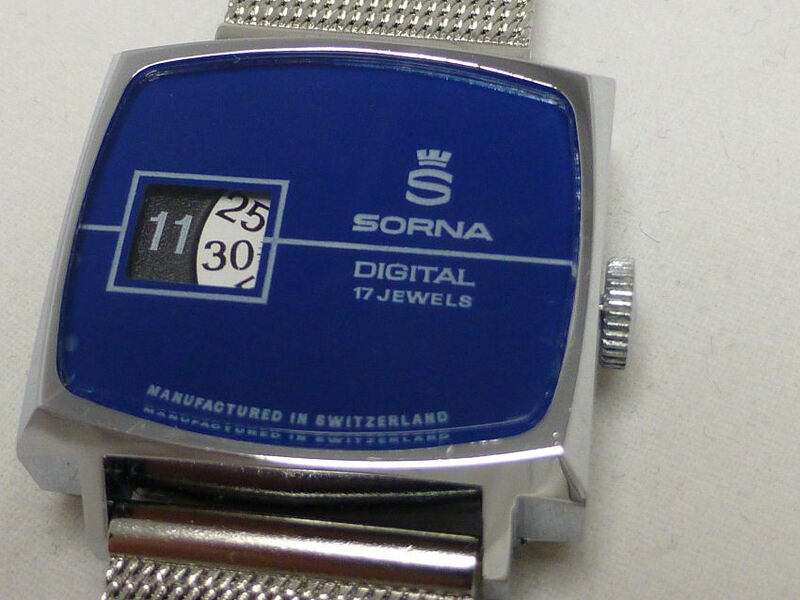 From what I can find out they disappeared in 1994, though a new Sorna in Germany today also make Trias watches. Whether they bought the name I could not say. 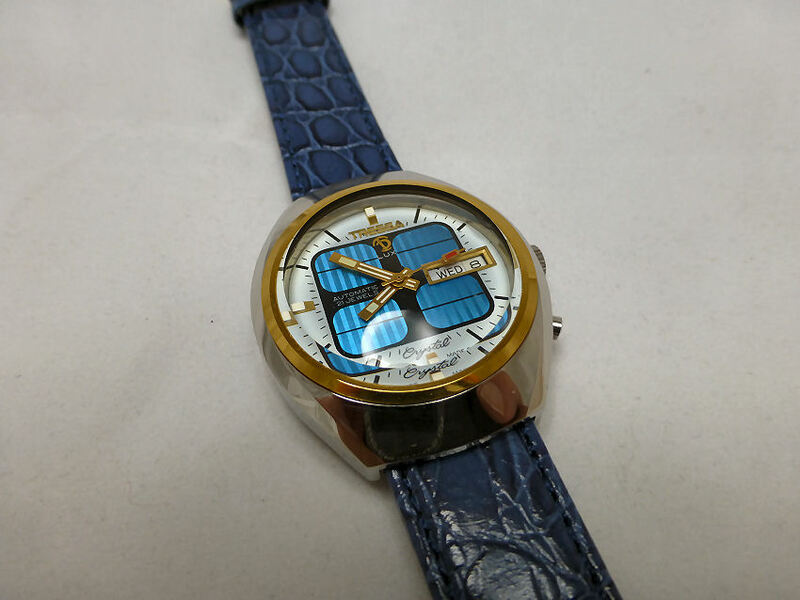 Sorna ladies “Jump” watch – described as “digital” though not as we know it today. Suffice to say, this particular model was born at the same time as the Hudsons as an attempt to stem the flow of cheaper Quartz watches from the East. By using mechanical movements as before they hoped to tempt the buyer with a digital look but using conventional components. Once again using Ebauche movements with hour and minute disc as opposed to hands, the hour either “jumped” into view at the last minute of the hour ended or slowly slid into view, depending on the mechanism employed. Thus providing a “digital” watch, though not as we would know it today. 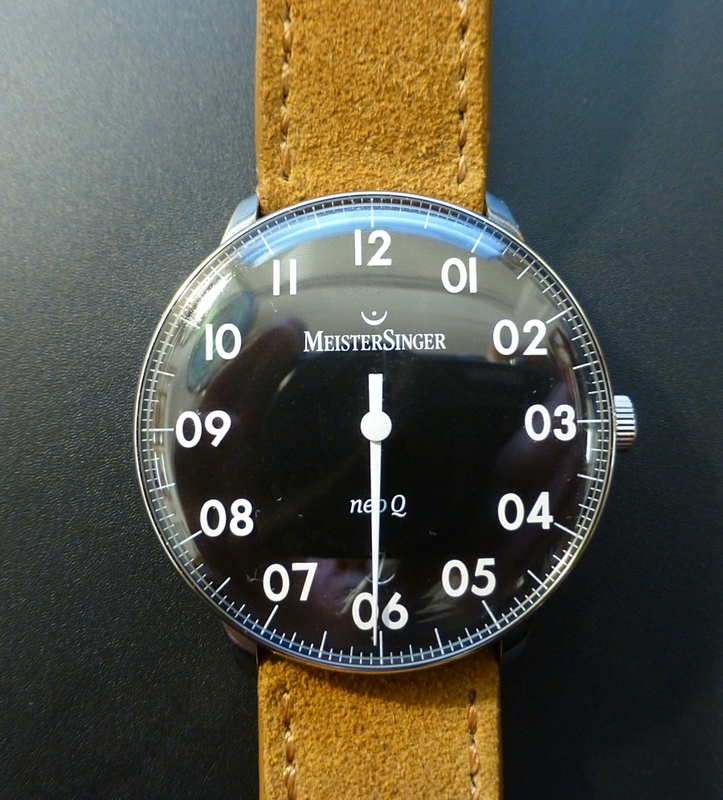 Note the high contrast numerals – easy to see on a small watch. I like this particular model as it has the Hour highlighted in white against black. This makes it stand out better than most especially as it is a smaller sized watch. Note this is a reasonable manual wind movement too with 17 jewels. Many other “jump” style watches often featured simple 1 jewel movements – so this is quite a decent watch. 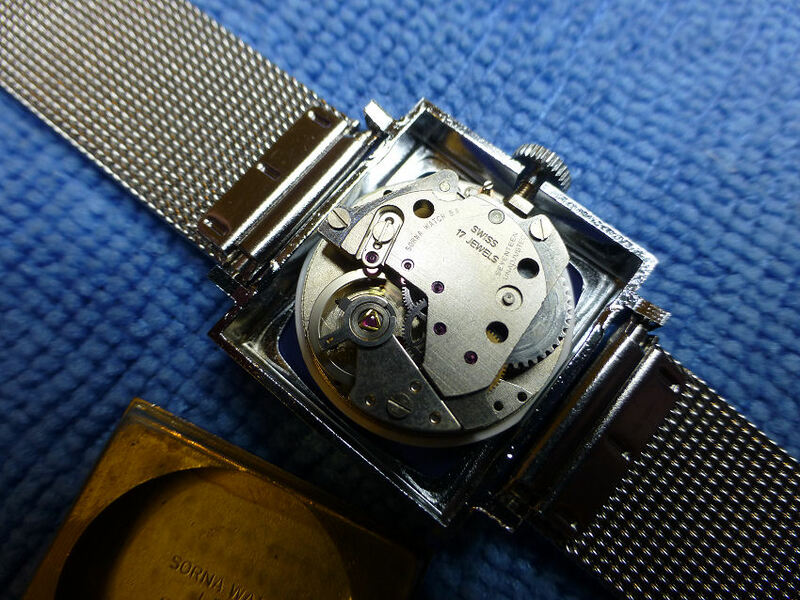 Neat Sorna signed Swiss 17 jewel movement in perfect as new condition. 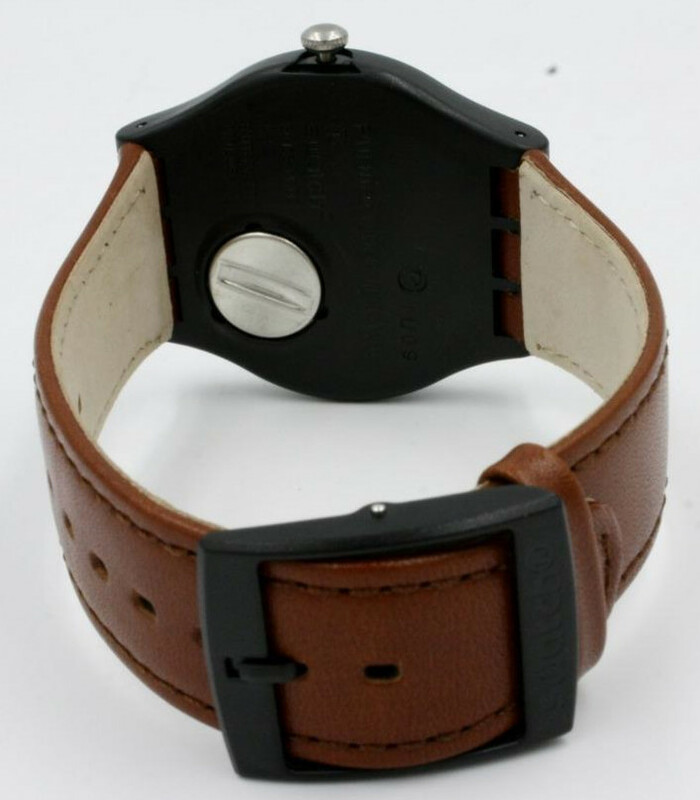 I have another high gloss, high colour leather strap for this watch and as my Wife is as fickle as I am regarding straps and bracelets, I won’t know until I change this bracelet to see which one will get her approval. I can see her choosing the alternative matching blue conventional leather buckle strap – but it would be dangerous to second guess her! Well I was right NOT to second guess, so I’ll not even show the strap – suffice to say she picked the bracelet! 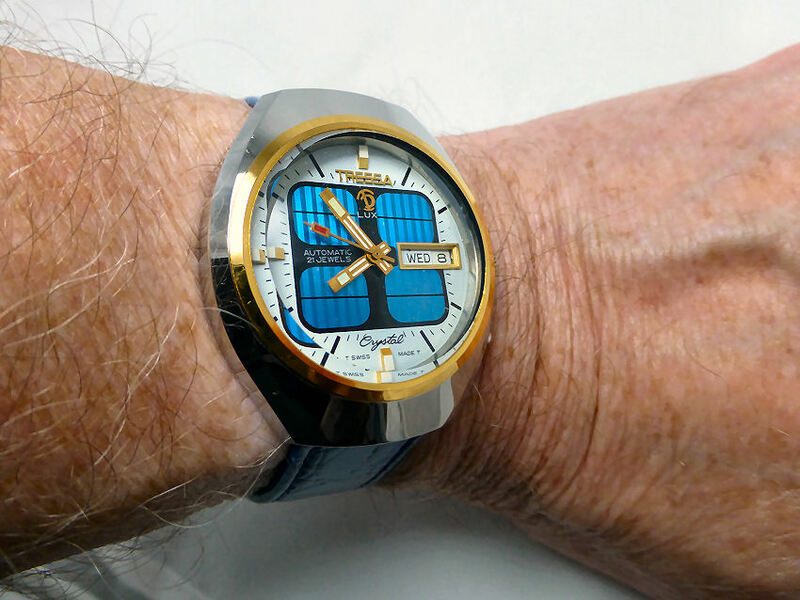 Another 1970’s variation from Switzerland is the Tressa watch. This is a nice NOS model which as you would expect is in absolutely pristine condition, never having been worn in it’s entire life. Powered by an AS 5206 (A Schild) Automatic mechanical movement with Day and Date, this is perfectly at home today as a day or dress watch. Nicely finished in highly polished stainless steel case with a gold plated bezel surrounding a mineral crystal. Lovely electric blue geometric dial decoration with quick set date via a push pin @4 and a clear Day/Date window @3. 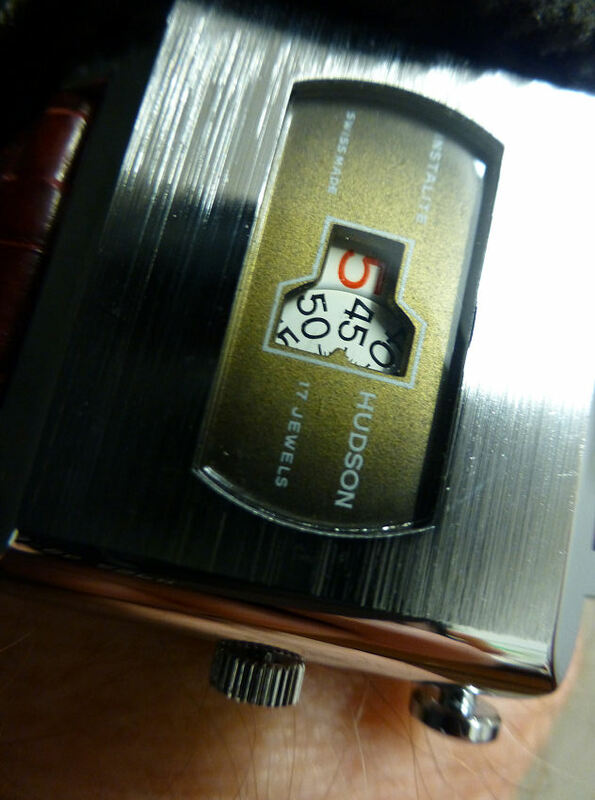 As with many of th 1970’s watches, the watch actually came with a Tressa stainless steel bracelet, but I’ve changed it. You may ask why and the answer is that so often mid range Brands from that period seemed to struggle sourcing decent straps and bands. The original one whilst also NOS and infinitely adjustable, is simply NOT comfortable as it catches my wrist hairs! So I paired it with a complimentary color leather buckle strap, as shown. I would note that rough bracelets are not confined just to cheaper Brands, as I have a Cartier model that is just as bad (worse actually) so it’s in good company! Stunning electric blue geometric dial decoration, makes this version noticed. AS movements have been around an awful long time and in fact were the largest movement maker in Switzerland by 1920, though in the 1970’s after the Asian onslaught, they merged into ETA in 1979. They were and still are very well regarded as a reliable movement with Brand customers almost from A to Z and derivatives are still used today. Tressa on the other hand have been around for a shorter period, coming to reasonable prominence from their base in Bienne Switzerland in the mid 1960’s and over the next 20 years till 1987 sold mostly to the Eastern market. During that time they almost exclusively used AS movements. Bankrupt in 1987, I understand Rado took over their remaining assets though some years later (vague details only exist) under the umbrella of Zeon Watch of Basel between 2000 and 2005 old stocks of AS520x movements and watches were finally cleared from their inventory. The main competition in their heyday prior to then was from the likes of Sicura and Orient who served the same market with similar styles (I understand the CEO of Sicura was involved in the early days of Tressa). In my Tressa the crown/hand adjustment is a quite stiff and whilst could be a characteristic it’s more likely a lack of lubrication after some 40+ years in a box! but it operates just fine. The Date is changed with a pin under the crown @4 and the dial design is rather smart (reminds me of the first solar powered, but of course isn’t). The broad Hour and Minute hands are easily seen and the sweep seconds Hand has a red marker tip. Looks good on the wrist and already has drawn comments. It fits my 6.5″ wrist perfectly. I also think it has some presence and it looks good on the wrist and features a great color combination that works very well. The Tressa Lux Crystal is quite a neat size at just 42 mm lug to lug, 36 mm across (x crown) and only 12.9 mm depth, also comes with a few different dial colours and designs and in today’s world works very well as a fashion piece. Depending on the color you choose it can be, as they say, mixed and matched, with shirts and ties in most colours, which is a plus. I’ve seen one in a superb green dial center which I particularly like – and seeing I’m in my 1970’s thing at the moment, I’m sorely tempted. These are still available NOS, which is amazing after all this time and at reasonable prices too. 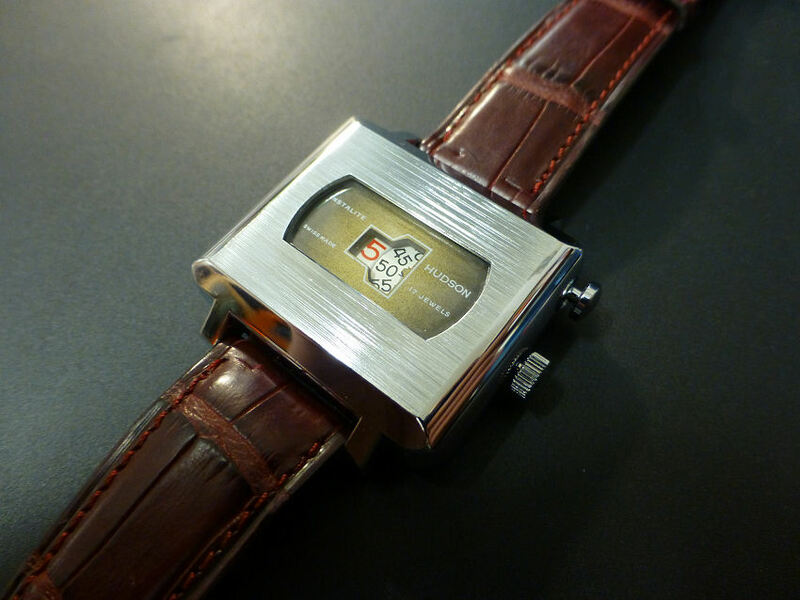 So it might well be worth it to seek them out as they have an individuality that’s sadly lacking with modern watches. Of course that’s the 1970’s for you – it was a time of not only technical revolution, but also real social invention and this Tressa model was born out of that time. 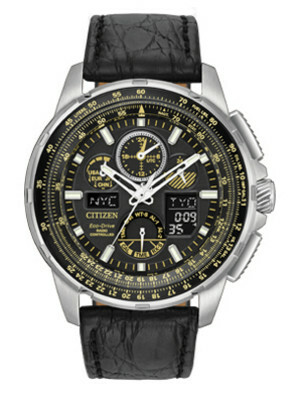 There’s something about the classic “slide rule” and “Hawk” style Citizen watch that brings out the pilot (hangar) in me. The Navihawk was first produced nearly 25 years ago and publicly available since 1993 and is still going today with many different variants. The inclusion of the slide-rule element around the dial was a touch of genius, even if only used by a tiny fraction of buyers. It was rather the “look” of this model that gained such a popularity then and now, that has managed to keep it looking as good today as the day it first appeared. The Citizen Red Arrow AT World timer. This example is the red Arrows AT World Timer, where the slide-rule has been replaced with the possibly more relevant World Time indication within the dial. This is in keeping with the new models, where the data displayed now is located IN the dial and not around the bezel, as the originals. 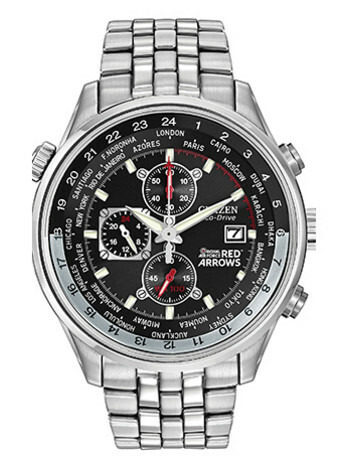 Basically this model is a Chronograph with analog date (no digital windows here), Eco Drive Solar movement. This model is positioned at an affordable price point (£200 ish) for most folks and is a great “wearing” watch – in other words – it looks brilliant on the wrist. However certain versions can reach much higher prices, such as the Limited Edition Skyhawk A-T model shown here – at around £1200. Note this model includes digital displays, which here are used for the World Time feature with and the inner dial bezels for the rotating slide-rule data. The overall Hawk series look is self evident and as such can be recognized the world over as a Citizen. There are as I say, many variations of these (I have 2 myself) and they always impress when worn and whilst they are dial “heavy”, Citizen have somehow managed to allow maximum clarity without much clutter, which is a trick few Brands can match. It’s fair to say they’ve managed to create a “cult” following, a market if you will where there may well not have been before – indeed a marketing triumph. And when it comes to the slide rule data. I wonder how many customers actually have a clue as to how it works, let alone use it? Maybe we’re all “hangar” pilots at heart, Biggles or Dan Dares (that’s showing my age!) – but who cares if all you manage is to tell the time. Don’t they look just great! I said I’d Post on some new watches just the other day, but didn’t really expect to feature another one of these! This is the Infantry Chrono-Pilot and I have to admit it looks way above it’s price point. Does that make sense? To clarify – it looks great! It really does and on the wrist is pretty awesome, which is surprising for a watch that measures across about 46 mm (without the crown) and pretty thick at 16 mm. But Infantry have done it again and have fitted a very soft flexible silicon band to standardish 24 mm spring bars. The result – it fits very snuggly even to my average wrist and at the same time looks rather impressive. On the dial, which is nicely arranged, there is a lower digital window showing the Time, Day and Month (selectable). Using the pushers you can also dial up Stopwatch and Alarm. The Day of the week is shown all the time on the small sub dial between 10 & 11 using digital segmented markers, with Sunday in red at the top, going round to Saturday at about 11 on the small dial. 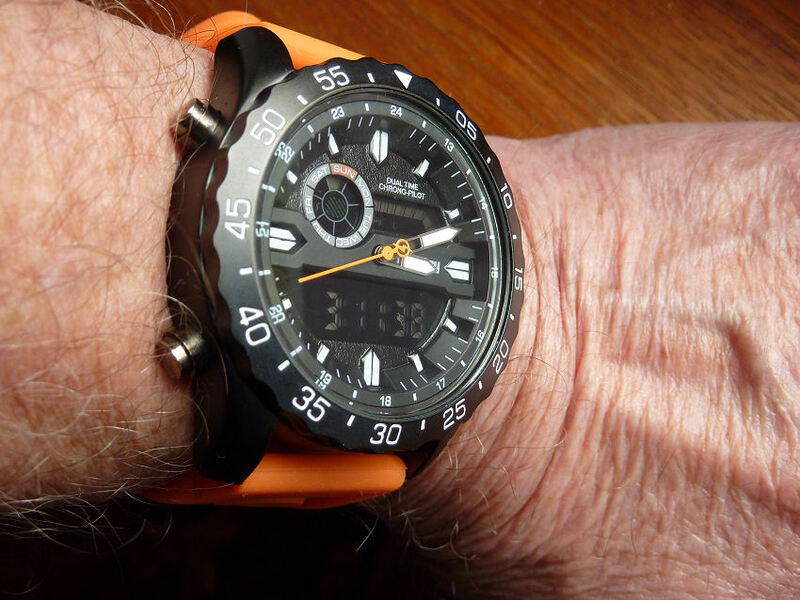 The dial also features a standard analog Hour hand, Minute hand and a running Seconds hand (in orange) AND I’m glad to report that Infantry have at last featured some luminosity, albeit just to the main Hour and Minute hands. There is also another digital window opposite the 2, which has a mobile segmental style counter of sorts – I say of sorts as I have to discover exactly what it represents. The square segment markers don’t seem to run in any identifiable order, though I suspect they should count 10 seconds in sequence, but they don’t – maybe a glitch just on this particular watch. However, it makes no difference to me as I never use these anyway. Note this could be an inherent weakness of the module used. After all this is a brand new watch and something I have never, ever experienced on a Casio, Timex or Citizen model – unless long past it’s prime and very vintage. This digital display also shows AM/PM and Alarm ON/OFF and it might also have a Chime indication. Unfortunately it’s hard to know as these indications are almost unreadable, as they’re too small and lack contrast or clarity to be of much use – a design error perhaps that those mainstream Brands mentioned would simply not do. However the main bits are fine – at a glance I can see the Time, both analog and digital, the Day of the week and without pressing any buttons or pushers – so that’s good. The watch overall is pretty easy to see and read, the dial remarkably uncluttered, the outer 60 marked bezel clicks one way and is still a handy basic time indication, say for a parking meter (sometimes simple is good). So after all that, what does it cost? Well it’s around £20 and if it goes as well as the old square Infantry model I got as a gift a couple of years ago, it’s not at all bad. It also has a decent build quality, nice materials and excellent finish. If you ask me if it matches up to the likes of the Casio or Timex low price point models, then my answer is – probably not. But let’s be clear – we are looking at a watch that costs no more than your average snack for two during your lunch break. . . . .
At the end of the day it is what it is and there’s no question that it really does look the part – and would I wear it? 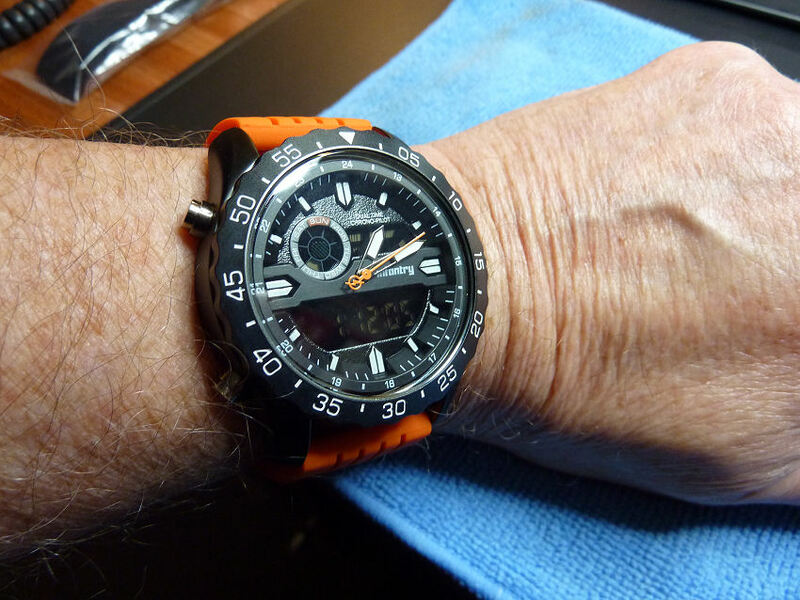 Re-straped using my favorite silicon deployment type – easier on the wrist. Well I got it just the other day and it’s still on my wrist – so Yes is the answer. And if you ask – Did I change the strap for a silicon deployment type – you know me too well! Ps – The segment issue – Do I bother to send it back to Amazon?- it is new and it has a Guarantee. 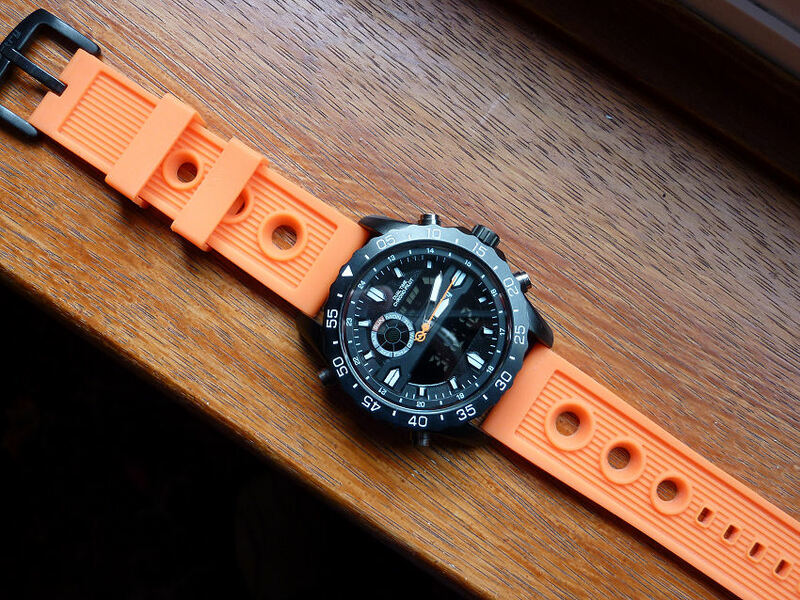 If it was DOA then I certainly would, but as the main functions are just fine, £20 is not a problem – I’ll stand it. . . . . .
Every so often I like to trawl the swatch world, just to see what low price models take my fancy. I like Swatch as the quality is invariably at a decent level as to ensure a good and reliable timepiece. Their quartz models in my opinion are almost always good value and more often that not, great fun to wear. Slightly funky colour-ways mean that if you are even a tiny bit dress conscious , then these can make a rather neat and subtle statement that you ain’t finished yet! 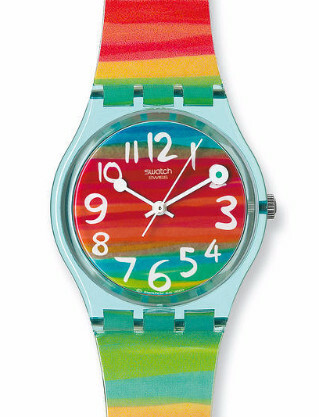 Unisex Colour the Sky Swatch model Quartz. This is the GS124 or the Swatch Unisex “Colour my Sky” quartz model – available for anywhere between £30 and £40 and OK is a basic 3 hand model without Day or Date, but has got lots of colour, both dial and strap. Dimensions just 34 mm x 8.75 mm depth, this is a very neat watch and will fit anyone. (and don’t be thinking this is too small – some of the best Patek’s are 34 mm!). It is what it is and that of course defines the ever so quirky Swatch range. The back has the usual coin screw battery access and the case is sort of see-through plastic and the dial layout works pretty well with the slight odd hands set up. In fact this one has a touch of the old “railway” clock look about it and is pretty easy to read. 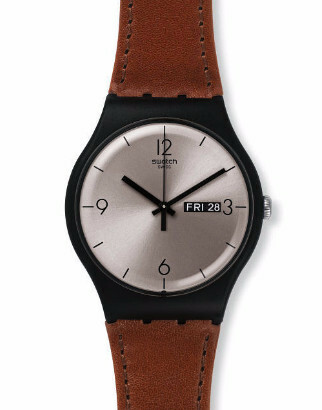 My next Swatch pick is the oddly named “Lonely Desert” (Day & Date) model (SUOB721) which is I suppose more gents that Unisex, though that said, is not a large watch either at 41 mm diameter by 9.85 mm depth, so still a neat wearing model. Price wise not a lot more than the first watch featured, but has the advantage of the Day and Date window. Swatch Gents “Lonely Desert” Quartz. I like this one as it features a leather strap in a really neat shade of “leather brown” that works well with the dark case. 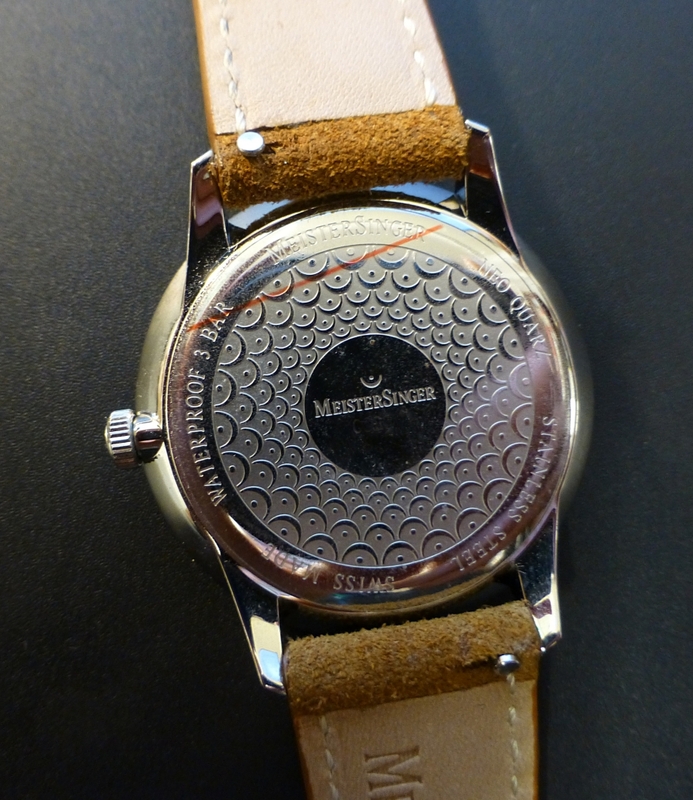 The dial is silvered and the Day and Date window stands out really well with white letters against a black background. This is a slightly more serious watch model than the colour sky idea and looks really good either in casual or in a formal setting. Typical Swatch coin battery access. Here’s a pic of the typical Swatch battery hatch system. So just a couple of models from the huge Swatch range that caught my eye, both very affordable, Quartz powered and yet quite different. I have to admit to a liking for quite a few of the Swatch Day and Date watches as they really do represent great value for money, especially when coupled to a quality standard that seems to stand up proudly on it’s own merit. I have a few friends who collect Swatches (sad I know . . .) and I reckon most of us know someone who probably has more than one and I suppose it must be gratifying to Swatch themselves as the “S” or second “Watch” idea (Swatch) has turned out to be such a success story. I’ll probably feature a few more of the ones that I like – and you never know, you might like the odd one too.